How Do I Know When a Stable Has Hit Form? No matter what, the recent form of a trainer should always enter into your calculations. It isn’t difficult to determine a trainer’s recent form. You can find it on a variety of websites including the Racing Post. As a rule of thumb, a trainer with a win percentage of 10% in the last 14 days is considered as being in poor form. Conversely, any trainer with a win rate of 30%+ should be carefully watched. If they have entered a favourite in a race, it is worth investigating further to see if that runner is worthy of its top of the betting market status. Trainers in red-hot form could also have a few surprising winners. When writing this, I came across one well-known trainer with 10 wins from 25 races in the last 14 days, a fantastic win rate of 40%. Meanwhile, another top-rated trainer had 52 runners in the previous fortnight with just four victories, a win rate of 7.69%. Clearly, Trainer A’s yard is in better form and is likely to be a better wager if both trainers have relatively strong runners in the same race. As this is horse racing we are talking about, it isn’t as easy as picking an “in-form” trainer by looking at the percentage win rate only. I recently took the liberty of looking at the performances of alleged in-form trainers and now present what I found. All data is from the beginning of 2014 in UK races only. Most people would agree that a 30%-win rate is pretty good for a trainer. Let’s take a look at how such trainers do across a handful of win percentage ranges. Although there are thousands of races with more than one qualifier, the outcome isn’t what one might expect. Trainers with a 30-50% win rate in the previous fortnight only win 20.97% of all races. Trainers in the 51-74% range provide a profit, but that 6% figure includes losses in three of the last five years. The most surprising outcome is the dreadful performance of trainers with 14-day win rates of 75+. You would make a 12.5% profit by laying their runners! Even when trainers have more than 10 runners in those 14 days, you will not profit by backing their horses in the long-term. There are several problems with looking at a trainer’s bare win percentage over a short timeframe. Trainers with a high win rate could have entered several short-odds favourites but are now entering a spell of training longer odds horses likely to be outclassed in upcoming races. Also, they could have a horse that has won several races in a row, but the handicapper finally catches up. Another thing to consider is a horse’s draw. Maybe the trainer’s horses had bad draws which prevented them from showing their full ability. In National Hunt races, a few horses could fall while in contention for example. The red arrow is pointing to a measurement known as Running to Form (RTF) while the blue arrow is pointing to the percentage achieved by each trainer. In the screenshot above, we can see that Tom George’s RTF figure is 37 while Ian Williams’ is 79. This means that George’s horses have run to form 37% of the time while Williams’ have run to form 79% of the time. The Racing Post’s RTF rating is an explanation of a trainer’s current form. The stat is calculated by taking the expected rating of each trainer’s runner before the race and comparing this figure to the actual race rating. The closer these figures are, the higher the RTF figure. Therefore, you should be wary of backing a short odds favourite if his trainer has a low RTF figure. The data above suggests that Darksideoftarnside has a chance of causing an upset because his trainer’s horses are running to form the majority of the time. Only trainers that have horses with a Racing Post Rating are considered when calculating the RTF figure. If a trainer has numerous unrated horses, his/her RTF figure is likely to be inaccurate. It is also the reason why some trainers don’t have any RTF figure beside their name. You need a lot of data for the RTF figure to be relevant. There is no point looking at it if the trainer has only trained a handful of runners in a season. The Racing Post says its rating only goes back 16 days. Ideally, it should look at the last month at the very least. The Racing Post may not take the previous day’s races into account. Therefore, if a trainer just had a brilliant afternoon yesterday, his/her rating does not reflect the recent success. You know a stable is in form if the trainer has a high RTF rating. There is no point in trying to take the bare win percentage at face value. Although the RTF calculations are laden with flaws, they are a good way to help you make your mind up about a race with more than one likely contender. Once you have found a list of contenders for the day, take a look at their trainer’s RTF. 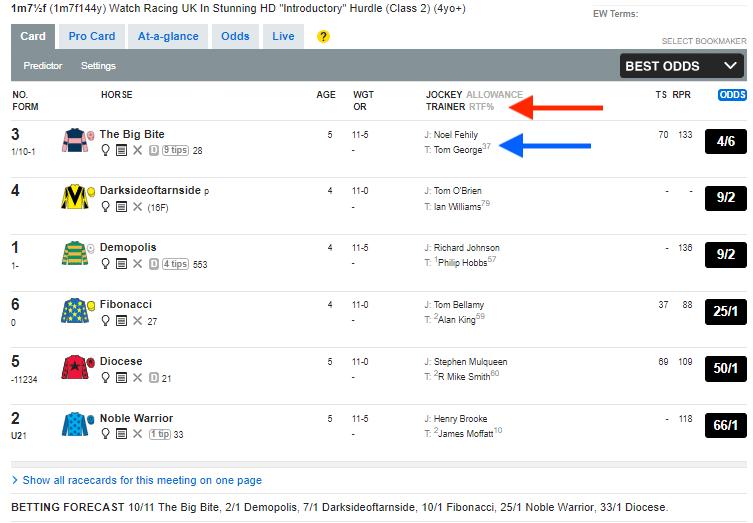 Also, click on the trainer’s name and make sure they have had a minimum of seven runners in the last fortnight. If the RTF figure is above 50%, it is probable that the horse will run close to the Racing Post Rating on the racecard. If a trainer’s RTF is 80% or more, and he/she has had several recent runners and winners, and the horse has a chance of winning the race, it is worth placing it on your shortlist, because it may exceed expectations on that day.